So you’ve got a new piercing, eh? That hurt a bit didn’t it? What most of you don’t know about punching new pieces of metal through your skin is the importance of the aftercare. There is nothing worse than having to get pieces of metal surgically removed from grotesquely infected skin….sorry to gross you out folks, but it can happen. So you NEED to know how to care for your pricey, painful new additions. Witch Hazel: This is the ‘good for all types of cuts and abrasions’ type of product. Witch Hazel is a natural astringent, it can fade bruises and blemishes, it can brighten your dark eyes, sooth irritated skin after hair removal, sooth haemorrhoids, etc. etc. I could keep going. It’s miracle liquid in a bottle. For one of my first big piercings, an industrial bar through the top of my ear, I chose this method of aftercare, wetting a q-tip with witch hazel and carefully cleaning around the piercing site. Saline Solution: Either store-bought saline solution, or even homemade. Saline Solution is part iodized salt, part warm water. Many of the piercing aftercare solutions that piercers will try to sell you are just that, maybe with a little antibacterial products as well. For my most recent rook piercing I used coarse sea salt in warm water, and I used store-bought ‘Dr. Piercing Aftercare’ when I got my nose pierced. Both equally as effective. Soap: If you’re going to use a simple soap-and-water routine, then make sure it’s a mild, colour-free, fragrence-free, liquid antibacterial soap. I would still try to use a q-tip or cotton pad when applying the soap directly on the piercing to prevent oils from your hands infecting the sensitive area, then rinse off with water. Remember to clean your piercing once a day. Start by washing your hands, and using a q-tip when actually touching the piercing location. For certain, more adventurous piercing (which I don’t have as much experience with), you should follow the piercers instructions, since they’ll probably be a little more in-depth than these instructions. Don’t try to clean it too much, or you’ll risk irritating the piercing. If you ever experience a Keloid, a small, hard bump on, or near, the piercing area don’t freak out! But don’t try to get rid of it by piercing, ‘popping’ or scratching. Crush a small, white, ibuprofen until its a powder, then mix with water to make a paste. Smear the paste on the bump then wash away once hardened. Do this once a day until healed. And once healed, enjoy!! I love piercings! So much fun, kinda rebellious, and not as permanent as a tattoo. 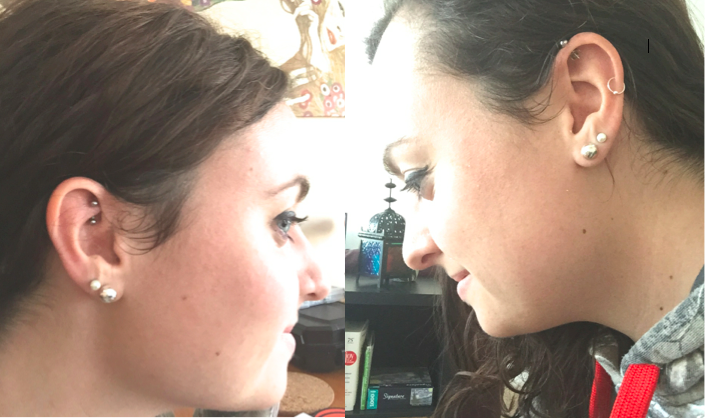 How have you taken care of your piercings?